If you haven’t heard of black garlic, you’re not alone. 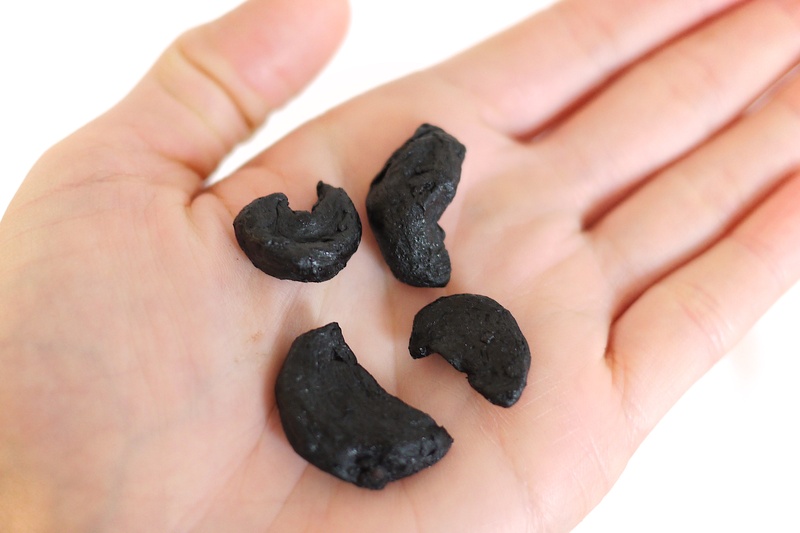 I only recently discovered the strange sticky little things that taste like a mix between dates, balsamic vinegar and, well…garlic. To be clear: black garlic is garlic. It’s actually created by a long type of “fermentation” in super-humid conditions and then allowed to oxidize afterwards which turns it black. This process changes the garlic from the cream-coloured, pungent, and crunchy bulb that we know and love to a sticky, slightly sweet and savoury food that tastes kinda like tamari or dates or balsamic vinegar. So, these weird-looking little black bulbs have not been cooked or charred like I first thought when I discovered them. The pseudo-fermentation process transforms the compounds in fresh garlic to a whole new range of health-promoting compounds. Black garlic has been shown to have double the amount of antioxidants than fresh garlic and might also have a higher concentration of those sulfurous compounds that are so great for liver health. I’ll admit, I was skeptical at first. But, now that I’ve played around with it a few times, I’m sold! On top of the interesting new health benefits, the taste is OFF. THE. CHARTS. So, I’m sharing this really easy glaze recipe that takes minutes to whip up and can be used on almost anything you can think of. I’ve used it here on crispy tofu, but it would be great on baked tempeh or poured over white beans. Oh, one tip first: if you find your black garlic bulbs to be super firm and too sticky to blend smoothly you can soak them in boiling water for ten minutes the same way you would rehydrate sundried tomatoes or dried mushrooms. Press tofu with clean tea towel to remove excess water. Cut into small cubes and blot again. Add black garlic, avocado oil, tamari and maple syrup into cup or mug and blend well with immersion blender. Set sauce aside. Heat coconut oil in skillet on high heat for about 1 minute so it gets nice and hot. Reduce heat to med/high and carefully add tofu cubes to pan (be careful not to splash that hot oil!). 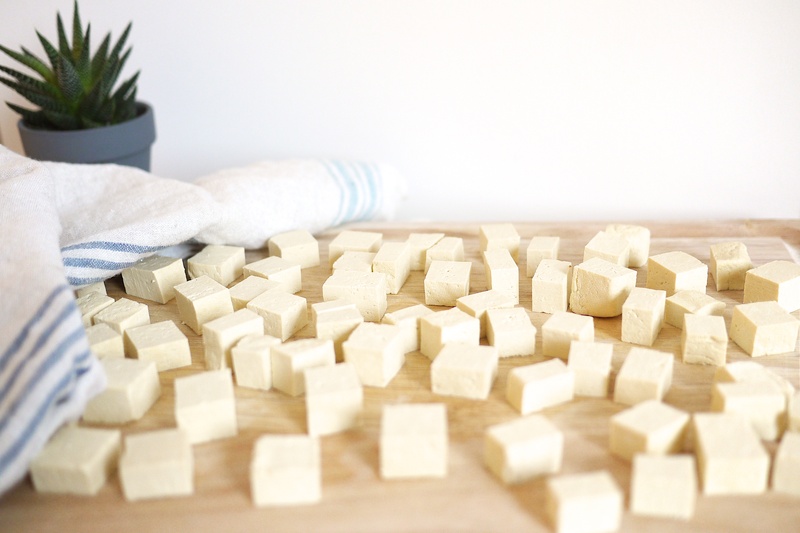 Flip tofu cubes often to ensure crispiness on all sides. This requires some patience. Once evenly crispy and golden, remove from oil and set aside. Carefully pour black garlic sauce into that pan and stir constantly for about 1 minute until it turns darker. 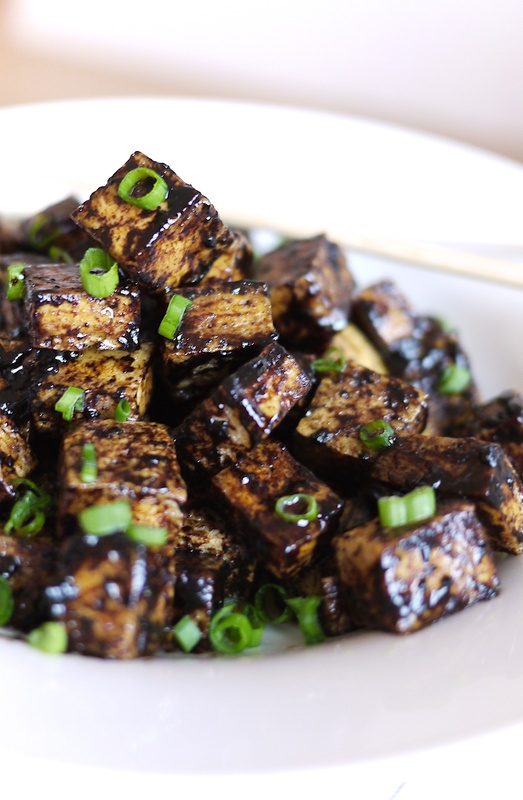 Slide crispy tofu cubes into same pan with black garlic sauce and stir to coat evenly. (Don’t leave in the pan too long if you want the cubes to stay crispy!). Garnish with sliced green onion and serve immediately. At the end of the day, frying and flipping all those tofu cubes in a pan is a tad time consuming. It definitely makes for a nicer final texture, but if you don’t have time to stand over the stove babysitting, the recipe works just as well with baked tofu cubes. All you need to do for this variation is skip the pan frying and, instead, coat the cubes in 1 tbsp of melted coconut oil and bake in a preheated oven at 425F for about 15-20 minutes (tossing around a few times) until all sides are crispy. 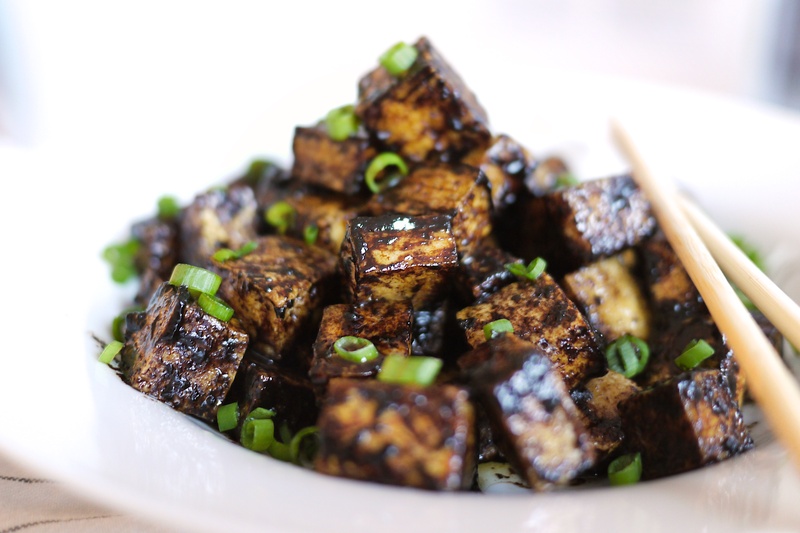 Then resume with adding that baked tofu into the pan of hot black garlic sauce. 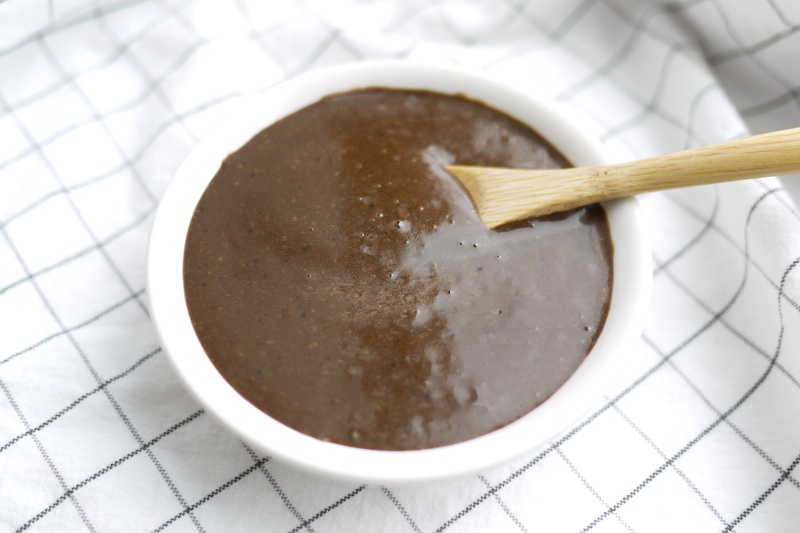 I’m dying to know if you try this out and what you use your black garlic glaze on. 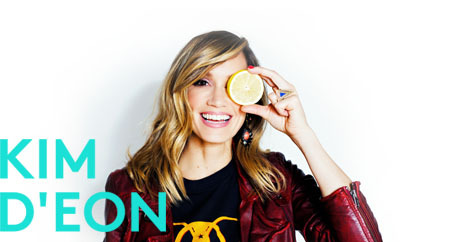 Post up your creations on instagram and tag me @kimdeoncom!